Envirotech Systems Manufacturer of Ceiling Acoustic Panels, Acoustic Ceiling Panels and Acoustic Wall Panels are an innovative method of absorbing reverberant & noise in rooms without the visual appearance of just another one of those boring suspended ceilings.The stunning visual effect of acoustic ‘clouds’ on a ceiling space leaves an occupant or visitor with an impression of flair and forward thinking on behalf of the designer of the room or hall. 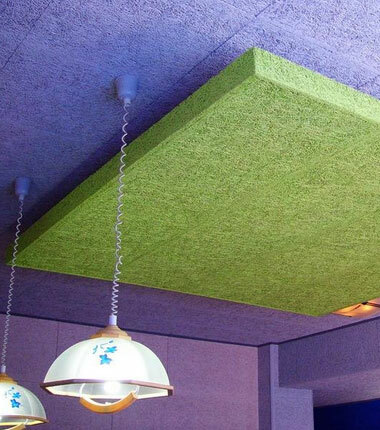 The installation time is fast as the Envirotech Systems acoustic Panels are simply suspended by steel wires from the soffit by means of special spiral hooks which are fitted in the rear of the acoustic panels. Also, this means that non-specialist fitters can be used to carry out the installation. The depth in suspension is simply adjusted by adjusting the length of the steel suspension wire. This also allows the panels to be installed at sloping angles if required, again adding to the visual design possibilities. The spiral hooks should be placed between 200mm to 300mm from the edge of the envirotech Systems panels. For sloping panel installations, we recommend the largest panels to be no more than 700mm x 700mm. The Envirotech Systems panel system will come with the spiral springs, 2m cables and the eyelet hooks. This version of Envirotech Systems has an Arctic white speckled painted finish on all 6 sides, giving a crisp visually attractive appearance. The panels are normally fitted as individual stand-alone panels as a design feature, with the distance between the adjacent panels to suit the customer needs. The perimeter of the panels is square edged.